Weighty Matters: Heart and Stroke Thinks Cookies are Grains! 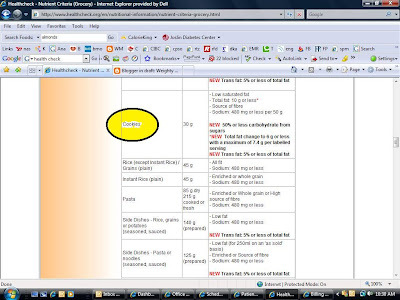 If you click on the image above you'll see a screen capture of Health Check's nutrient criteria page for groceries. The column where I've highlighted cookies is their grain column and yes indeed, if you look carefully at the screen capture up there they also for reasons beyond me, consider potatoes a grain (last I checked they were a starchy tuber). But let's get back to the cookies. In what alternate universe would cookies qualify as a grain choice? Canada's Food Guide does a far better job than Health Check's criteria at steering people to healthier choices. "Limiting foods and beverages high in calories, fat, sugar or salt (sodium) such as cakes and pastries, chocolate and candies, cookies and granola bars, doughnuts and muffins, ice cream and frozen desserts, french fries, potato chips, nachos and other salty snacks, alcohol, fruit flavoured drinks, soft drinks, sports and energy drinks, and sweetened hot or cold drinks." So not only does the Food Guide not think that cookies are grains, it recommends that they be limited. It also recommends that muffins, granola bars, ice cream, french fries, fruit flavoured drinks and sweetened hot or cold drinks be limited. The Heart and Stroke Foundation? So again I've got to point out, if shopping with the Health Check is like shopping with the Heart and Stroke Foundation's dietitians, and if the Heart and Stroke Foundation's dietitians think cookies and potatoes are grains, that french fries, sugar sweetened milk and slush puppies are healthy, don't you think it's time for them to hire some new dietitians? Oh and Heart and Stroke Foundation, please stop hiding behind the Food Guide because the fact is you don't even manage to follow the Food Guide's albeit meager nutritional recommendations. Regular readers, this is indeed Funny Friday. It's one of those schadenfreude ones where cookies have magically become grains. UPDATE: July 23rd, 2009. In their newest (July 09) criteria Health Check has finally realized that cookies and potato chips aren't healthy! They've removed them from the health check program!